Rick Perry made headlines for calling Social Security a “Ponzi scheme” in last night’s presidential debate. Mitt Romney and statist media sources predictably attacked this position claiming that the insolvent program is A-Okay. To be fair, Rick Perry isn’t the only Republican candidate with the courage to speak truth to fiction about Social Security. Ron Paul has likely been calling the entitlement program a Ponzi scheme long before I was even born. It’s suddenly become popular to call Social Security out for what it really is: a compulsory Ponzi scheme. 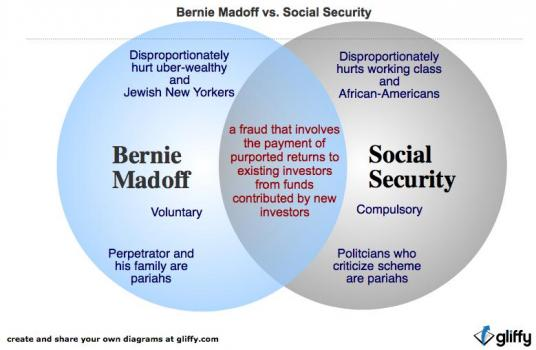 Social Security is the definition of a Ponzi scheme with a few notable differences. Charles Ponzi started a money making scam that would later be known as a Ponzi scheme back in 1916. He persuaded people to allow him to invest their money but he never made one investment. He simply transferred money from his later investors to his earlier investors. The unsustainable system inevitably collapsed. Charles Ponzi was then convicted of fraud and spent years behind bars. Social Security has many similarities to a Ponzi scheme but it’s even worse. The main difference is that Ponzi schemes are voluntary and Social Security is mandatory. Everyone is forced to pay Social Security payroll taxes whether they want to be part of the system or not. Just like Charles Ponzi’s fraudulent scheme, money from “later investors” or young workers is transferred to “earlier investors” or retirees. Ponzi schemes are always great for earlier investors but rip off those who invest later on. The number of retirees is growing far faster than the number of new workers. The ratio of workers to retirees has grown from 42 to 1 in 1940 to just 3.3 to 1 today. Social Security is facing more than $20 trillion in unfunded future liabilities. Young people actually believe that they have a better chance of seeing UFOs than a Social Security check made out to them when they retire. Some people especially those on the left wrongly call us “cruel.” But think about it: how cruel is it to force a young person who believes they will get nothing in return into a system? Why should young workers who are just starting out in their careers be forced to pay for the Social Security benefits of elderly millionaires and billionaires? Seniors are much wealthier than young people on average. Individuals should be free to opt-out of Social Security if they wish. People could then stay in the insolvent Social Security system or invest on their own. If Social Security is so "great", why is it mandatory? Private sector retirement plans can provide safer plans with higher benefits than Social Security. Unlike Social Security, the assets in the private retirement plans can be rolled over to a surviving spouse or other family member. We need more retirement choices instead of being forced into a terribly mismanaged government monopoly. The Venn diagram above made by The Examiner’s Tim Carney shows the difference between Ponzi schemes and Social Security. Bernie Madoff, who was responsible for the largest Ponzi schemes in history, was sentenced to 150 years in prison back in 2009. But the federal government’s Social Security scheme is somehow mandatory. Politicians who criticize Social Security are indeed considered pariahs. Think Progress says that it is “nuts” to even compare Ponzi schemes and Social Security. The Social Security scam disproportionally hurts the working class and African Americans. Tim Carney says that, “given that black men have a lower life expectancy, they get shortchanged on the benefits end.” The life expectancy for an African American male is just 69.7 years—versus 75.5 years for white men. The Social Security retirement age is 65. This means that close to half of African Americans males will die before every receiving a dime of Social Security benefits despite paying into the system all of their working life. How is that for cruel? Social Security is a compulsory Ponzi scheme. As Cato Institute scholar Roger Pilon says, “a private company that ran such a scheme would be prosecuted in less than a New York minute.” Social Security is a hopelessly bad deal for today’s worker. Americans should be allowed to invest in their retirement as they see fit—not be forced into a mandatory Ponzi scheme against their will. We need more presidential candidates with the guts to propose allowing individuals to opt-out of Social Security. I think it's important to mention the glaring difference between SS and Ponzis, which is that there is nobody stealing some or all of the money from the fund for their own use. In a Ponzi scheme with nobody taking money out you wouldn't get profits, but you wouldn't lose money either. SS isn't perfect, but while my mother's carefully invested 401k lost 50% of it's value the year before she retired, SS has been a godsend. As a young(ish) adult, I have no problem paying higher rates if necessary to help cover the baby boomer bulge. Social Security is a pyramid scheme not a Ponzi scheme. Both are illegal for the financial, and insurance business / commercial or non-profit. 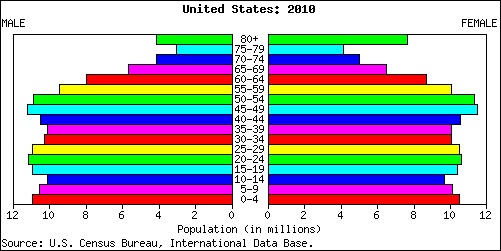 The U.S. population pyramid provided the growth base for Social Security but in 2010 every age group younger than 50-55 forms a column not a pyramid. With out pyramid growth the system fails. With this population structure Social Security is a fraud for every one under 50 years old. Show me where Romney called SS 'A-Okay" I won't wait because it didn't happen. What he did say is that it needs serious reform, and it does. We can't back out on the promises made to our seniors but need to change things now. I am raising my children to never expect to get anything from SS, even though they will have to pay into it. the people behind this article does not want Americans to remember how many of America's seniors lived in poverty before we had social security, nor to they have any valid alternatives. Something they also don't mention is the fact that social security is operating on approximately $115 trillion deficit. Which means at that rate, the $2 trillion dollar surplus will be spent in under 20 years. Social Security was a horrible idea in the firstplace and reform needs to be proposed in order to prevent a major problem in the future. If you privatize the system now, the only problem that will arise is the fact that there wouldn't be enough money coming in to pay for current retirees (definition of a Ponzi scheme by the way). As a younger worker, I do not expect anything from social security when I retire, and I am making my own preparations for my retirement and do not expect the government to take care of me when I retire. I also wish the rest of America could take this approach and then we would not have the social security mess that we're in. There's much to dislike about Social Security and plenty of reason for young people today to be skeptical of whether they will ever see the benefits we're being promised, but you are factually wrong to call it a ponzi scheme. Ponzi schemes, by definition, require an ever-increasing pool of contributors in order to provide profit distributions to prior 'investors'. Social Security is essentially little more than a transfer payment. Money I make now is taken from me and given to someone else. There is no profit payment involved and there is no need for the pool of contributors (workers) to forever increase. For social security to be sustainable, there is only a need for the money taken in the form of taxes to equal the money being paid out. The required balance of tax rate and benefit payment logically shifts over time as the population of workers and retirees fluctuates, but it aside from the superficial similarity of one group of contributors providing the funds from which another group is paid it lacks all of the substantive (and stucturally unsustainable) characteristics of a ponzi scheme. All of which is a particular way of saying that the greatest liability the tea party and those in favor of truly limited government face is the unwillingness and/or inability to separate incendiary rhetoric from genuinely substantive argument. The falsity of the argument that social security is a ponzi scheme only serves to undermine the accurate and substantive objections to what the system is and how it currently works. human rights jurisdiction with a misapplied income tax most of us never owed. windfall profit volume of the attorney and accountancy unions~! It's time we re-prioritize our *practicals*. misapplied income tax... now that's a topic! To think about all of the wasteful spending our government does with our money makes me want to scream. The SS Department has told many in correspondence that participation is not required, but only voluntary. Through fraud and abridgement, corporate and unwritten policy foster the misconception. Sure, SS rules are mandatory for everyone who has volunteered into the program. That's where the accountants and attorneys come in to foster the lie, with the corporate world enforcing it. In fact, IRS codes and regulations allow full indemnification and exemption from the negligence penalty, related to the reporting of 1099 income summaries, for those who ask for SS# data, but are refused that information. If someone has no current number, they cannot very well give it over. The Privacy - Paperwork Reduction Act also guarantees indemnification. Why are attorneys and accountants not providing this remedy~? Well, it doesn't exactly help their windfall workloads, now does it~? This week, the Congressional Budget Office came out with its Long-Term Budget Outlook for 2015. The report foreshadows growing deficits, mounting debt, and economic harm if the status quo is allowed to continue. In addition to proposing an onslaught of spending increases and tax hikes in his sixth State of the Union address, President Barack Obama will, according to The New York Times, "effectively declare victory over the economic hard times that dominated his first six years in office and advocate using the nation’s healthier finances to tackle long-deferred issues like education and income inequality." The Congressional Budget Office issued another dire warning last week on the ominous state of the Social Security, the social retirement and disability programs created by Congress in 1935 as part of President Franklin D. Roosevelt's "New Deal." You know what they say you should do when you’re stuck in a hole: stop digging. This is advice that could well have been heeded by ObamaCare Architect Jonathan Gruber, whose repeated comments about the stupidity of the American public and the need to deceive them in order to pass ObamaCare continue to make headlines, though not the good kind like you want. Personal Freedom and Prosperity 110: The Rule of Law A government with moral and legal authority promulgates written rules and universally, impartially and uniformly enforces the rules, which provides a predictable and stable legal order on which to base economic and personal decisions. The law prevails, not the proclamation or arbitrary decision of a ruler, government bureaucrat, the enforcer (e.g., policeman) or judge. A recent report out of Mesa, Arizona demonstrates the inevitable negative consequences of supposed problem-solving government programs. Audrey Glemba, a 49-year-old triathlon runner, became a medically-retired police officer collecting worker's compensation for an injury she claimed prevented her from working. Taxpayers in her city are now paying her $508 a month, in addition to medical retirement benefits. Democracy and Power 103: Government MoneyIn general, the art of government consists in taking as much money as possible from one party of the citizens to give to the other. —Voltaire (1764)Politicians transfer money from productive people to favored special interest groups. Yesterday, President Obama made a speech in which he essentially declared that the rest of his presidency would be spent chasing a dream of societal equality, in the name of fairness. The concept of fairness in America has been horribly and tragically distorted by this administration.